Which coffin do you fancy? Who wants to visit death on vacation ? Believe it or not, a visit to Ghana’s coffin makers is on most tourists’ itineraries here!! In European cultures, we cremate our dead or bury them in a simple pine box. But coffins are a lot fancier in Ghana, where the Ga people believe that life continues in another world after death, and they want it to carry on in style. And while a funeral lasts just a few hours, since eternity is, well, eternity, it’s important to spend it in style!! In April 6th, 2016, I had an interview with Eric whose grandcather created the first fantasy coffin. You can learn more on their Ghana coffin history website. The reason why mostly all ghanaian use such coffins is their religious beliefs regarding the afterlife. They believe that death is not the end and that life continues in the next world in the same way it did on earth. The social status of the deceased depends primarily on the importance, success and usage of an exclusive coffin during a burial. During the delivery to the customer, the coffin is enveloped of kraft paper or cloth because tradition wants work to be revealed only at the time of funeral. Certain shapes, such as a sword or stool coffin, represent regal or priestly insignia with a magical and religious function. Only people with the appropriate status are allowed to be buried in these types of coffins. Some animals, such as lions, cockerels and crabs can represent clan totems. Similarly, only the heads of the families concerned are permitted to be buried in coffins such as these. A fisher will be buried in a coffin in the form of fish or in a fishing boat, a professor in a fountain pen balk, etc. The one who used to ask for a “beer shape “coffin was first not well seen by ghanian…but these years now, it is no more seen as an hard drink person but a person enjoying festivity in life. The ghanaian who asked the bottle of coke or fruit juice were working in theses companies. The aspirations of the missing person are reflected by the coffin which is intended for him: the plane for instance was never ordered to bury a pilot, but resides a symbol of distant trips testifying a social success. Same for luxury cars. Fish are very popular designs–the fishing industry is big here–as are Bibles, the only fantasy coffins allowed in churches in this deeply religious country. Fantasy coffins are produced only to order. Carpenters have several apprentices who allow the them to make several coffins simultaneously or all work on a single one in urgent cases. The coffins are generally made from white light local wood and not very expensive as the wawa or Nyame Dua. It will take two to six weeks to produce the coffin. The woodworking is done using the simplest tools, without the aid of electrical ones. Building is more or less complex according to the form of the model, the desired level of details. The coffins of cylindrical or approached form (fish, mammals, fountain pen) are accomplished as a model of subject without worries of the opening intended to accept the body. This one will be later cut up. The painting of the figural coffins can take up to two days to finish and are painted by the head of the workshop, local sign writers…. who usually decide together the coffin’ s patterns and colours. One shop may produce 20 coffins by months. There are about 10 in Accra. In a country where many people live on barely $2 a day, no expense is spared for the most important part of life: death. With prestige riding on the size and extravagance of the funeral, family members collect, borrow, and donate money to send their loved ones off to the afterlife in style. Funerals can cost up to a year’s salary. Eric’s grandfather was the one who had the idea of such coffin, first for himself and then it spread in all the villages around …until Accra. Now Eric is proud to open one more studio in Kumasi this year 2016. In 2009, he was asked to participate in a moovie for coca cola ads for Spain to explain ghanaian coffins can see on youtube the Coca cola coffin TV ad. Since then, he travelled a lots and still makes exhibition all over the world : in Russia in 2010’s (he did a Vodka bottle ;), Korea …. he sells one for $5000 to $10000 dollars now but it takes him a month to create it himself alone in the host country ! For exemple, in the US, in 2011, he created a coffin in shape of a gun, and they cut it in 2 during the exhibition to show and ask people to stop violence. Another one was to preserve environment : it was a “fish coffin” with plastics inside. Plastic kills fish when they eat that in the sea…and coffin means death of course..
A very symbolic art ! The coffins cost between $300 and $1000 for ghanaian defunt with trees from kumasi uch as “wawa”and galeries or museums buy coffins up for $10,000 with wood from mahogany or “emery” wood. Recently, ghanaian have recognized the quirkiness of their coffins design and have reacreated them in gift size for tourists. There is now a roaring trade in the smaller version ! Hope that if you come one day in Ghana, you will take time to discover this art with fantasy ghanaian coffins and talk to Eric in his coffins workshop ! WEEK END IS STARTING AT LAST 😉 !!! It is time to rest out of Accra!! At 40 minute drive from Accra, just past krokobite beach and you get to is this little piece of paradise to escape at last from the crowded and noisy Accra. Here is the nearest beach from Accra : BOJO BEACH ! Entry fee is Ghc 15 but be aware that you are not allowed to take your own food or drink. You will walk on a stone trail to a large canoe-type boat which will takes you across the lagoon to the white sand of Bojo beach. You can also have fresh coconuts for 2 GHC to quench your thirst after swimming or having a walk along the beach. The sea is quite clean, the beach all around the restaurant also, but all garbage are hidden in holes under the sand…… you can see in front of you the man “cleaning” by digging a hole and put all the litter inside…. You can talk to them and they will love to explain their work. Today, I met Francis a ghanaian from accra, who come every week-end to Bojo Beach to go fishing from 6 am to 11 am. During the week , he works as a security guard in Accra Mall. They sell their frying of fished on markets or to you if you want of course. ==>But what I saw is so so so small fishes …. The waves tends to be strong and you have to swim well and dive under each wave coming to you … it can be quite difficult to stay along inside because of it. The sea is hot and you feel good inside! Some people also play in the volley ball court but it is so hot that I did not even tried once! Be awared also that music start from 2 pm from the restaurant : so if you feel like dancing, and love music, it is perfect !! But if you want to rest in a quiet place, it is no more possible. So you should choose to come early and leave early ! On the afternoon, you can have a walk and discover all the colored fishing boat in wood, and meet ghanaian tidying up and folding fishing nets, and also children collecting crabs to cook ! Since it can be far, I had the security guard following me. Colored fishing boats along the coast are particularly wonderful at sunset. Do not hesitate to go to Bojo Beach ! Leave me me comment if you have liked this article ! Thank you !! When you arrive in a new country, you have to find out the shops according to what you want to eat and above all depending on the money you want to spend for it! Starting eating local food? Go on eating western meals? Ghanaian are walking next to traffic light where cars stop with fruits, chips, water, bread but also electronic, telephone card, even paintings!! in order to sell it. They mostly carry it above their head which is particular from Africa! We really wonder how they manage to carry such heavy things on their head!! Their prices are quite low and you can negociate. Unfortunately, it is not allowed by ghanaian government (except for telephone card because it’s their job for a mobile company). I saw police coming and running after them in order to take all their goods so that they can’t sell it anymore. It is really difficult as my driver told me, because these ghanaians have nothing and only try to eat everyday with selling this type of product. I was really angry and found it incomprehensible. Ghanaian who can afford it have small shops (one room) where they sell vegetable, fruits and other things to eat. Their prices are quite low to and you can sometimes negociate. Moreover, I think it’s better to keep Ghanaian their business going than making the rich distribution group richer………. Vendor at Makola Market, Accra, Ghana. , kithenware, fabrics, shoes, jewels, beads…….. and you can negociate prices of course! It is both in open air and in old buildings all around. There is a parking too. You should not take photo. I tried one day but they wre angry about that.I will be better to enjoy the flow and enjoy and speak to them with smile. – a colourful open-air department store spread over several blocks. Koala is a lebanese supermaket (in both Aiport or Osu area) where you can find easily food from everywhere and freezing things too. Prices are high but there is a free card with 5 % discount. It also offers you basic foodstuffs, bakery (french bread for 3,5 GHC). The Koala in Osu is bigger than in airport. Palace is also a bigger supermaket on spintex road. Bread and Wine bakery and Delicatessen is located in OSU. It imports all his equipment and grain from France ! Bread and patisserie is baked each day and you will be like in France with your French baguettes your brioche, raisin bread… There is also very expensive french cheese, pizzas… I really like the outdoor and indoor setting . What’s more it is simple with nice classy decoration and you can rest easily next to the swimming pool since it is not noisy. Waiters are great and the strawberry cheesecake is heavenly ! The newest and most popular shopping centre in Ghana is Marina Mall (in Airport). The supermarket in on the ground floor selling many expensive foreign goods but also good and cheap meat, fresh fishes and Deli counter. There are three floors of shops (expansive clothes, watches, computers, pharmacy), and a food court (KFC, DeliFrance). Well known french brands such as Benetton, Clarins, and Façonnable are here too. You can also find to take you ID photos on the 3rd floor. In this mall there are clothing boutiques (african fabrics such as Woodin and Vlisco, or famous brands like Levis, Puma, Swatch). Shoprite is a food shop and Game has food, electronic, fitness and cooking equipment, but also tools, bedroom, kids and bathroom staff…. You can have lunch in a fastfood or restaurant there). On the first floor, book and music store are next to the cinema, showing current blockbusters, Nollywood and Ghanaian films. Concerning Shoprite, it is Africa’s largest food retailer and has a wide selection of foods including imported meats from South Africa. There’s also a deli counter, and large selections of wines as well as household goods. Prices are cheaper compared to Marina Mall and Maxmart. You will find A&C Square offering clothing shops (Woodin), coffee shops, entertainment ( a modern health club), Vodafone, food retailer, and also health clinics and a vegetable/fruit ghanain shop next to a children’s play area. This three-storey supermarket has a good bakery and a large deli counter (with cold meats, cheeses). On the 1st floor, there are brands such as Clarins, Mont Blanc and Lancel ! On the second floor, there is a large selection of homeware such as bedding, glassware, candles and picture frames. Now, lets see the prices of goods in Malls or supermarkets. Local fishes are also very good and is not expensive. Chicken is known to come from Bresil and people say it is not good one but personnaly, I eat chicken very often and I never got sick ( 30GHC for 1kg)! On the other hand, fresh vegetables are more expensive. For tomatoes, you will have to pay 6 GHC for 6 very small ones. A small salad (for only 2 people) is about 3,5 GHC. Some are only available frozen such as beans, broccolis and spinach (25GHC for 500g) and it’s very difficult to find. There are often out of stock…so when there are available, you buy a lot to fill your freezer! Yogurt are really unaffordable in my view : one solutionis to make it home! Many expat women bought a yogurt maker (as I did) and it’s very easy and quick to do! 500g pasta are about 10 GHC. Cheese (french always eat that!) do not come cheap neither : at least 100 GHC for 1kg. Wines are also expensive and moreover the quality is quite bad for not saying very bad… The less expensive one is about 15 GHC (for cooking one). Mostly it is around 40 GHC the first level. So be prepared to get used to life here or bring back products from France ! (I never had problem at the airport, even if my suitcase was smelling like feet!!!! Here, you will see that women expat buy their food in different shops because prices are sometimes twice more from one to the other and some products have a better quality too. It makes shopping a bit complicated but you know women expat have time. For two people we spend about 3000 GHC eating western food (with cheese, bacon, ham… which are expensive). Underneath, you can see the prices for each basic product to make your own average. GHANAIAN DIFFERENT TYPES OF FABRICS: BATIK, KENTE AND WAX. Ghanaian women wear typical fabrics which are beautiful to see in streets. They are wearing well cut dresses with lively colours and complex patterns. It is an essential part of the landscape in Accra. Wildly patterned wax-printed batik clothes are extremely egalitarian in Accra since both street vendors and socialites wear it. In streets, you can see gorgeous synthesis of traditional and modern fashion. Esther is known to have the best batiks in Accra. She uses beautiful colours and patterns in her handmade batik prints. She also propose to expat women to batik workshops with Esther at her home in Madina. Accra Accueil propose this activity with both mother and children. I did it and it takes about 3 hours to create your own batik to take it home ! At the end, you just have to wait that it is dried to take it home! It is such a typical activity to discover ! In the late XIX , Wax was copied by english and dutch settlers in Indonesia from Java Island wax. They learned and reproduced wax process and changed with vibrant colours. Then it is said that ghanian soldiers working in Indonesia brought wax back to Ghana. “African wax prints” are omnipresent and common materials for clothing in Africa and Ghana since 70’s. In Togo, this business done by women in the 70’s called “Nanas Benz” (because they had Mercedes Benz car), was very successful . Normally, the fabrics are sold in 12 yards as “full piece” or 6 yards as “half piece”. The colors comply with the local preferences of the costumers. Mainly clothing for celebrations is made out of these. Kente is one of the most typical symbol . It is an Asante ceremonial cloth, representing numerous aspects of Ghanaian ethical, philosophical, social and religious heritage through variations in colour and pattern. Although machine made kente is now widely available, it is still reserved for formal occasions. The dramatic colour and texture in kente is echoed in wax-printed fabric. Kente are sold in malls and in markets. How Ghanaian women get dressed is essential for funerals, weddings and engagements which all require specific dresses. Most women employ a seamstress and choose a style from a ‘calendar,’ a poster showing photographs of models in outfits. These designs are usually variations of the kaba (blouse) and slit (long skirt), a common ensemble. There is no lake of design in Accra. More and more people design exciting wax print garments. At the moment, western silhouettes in traditional fabrics are very much in vogue. Europeans expat are more an more wearing also these beaytiful fabrics and they make different as a pure, shoes, and even earings! Sewing is a lucrative business so you’ll find a seamstress operating an old-fashioned foot-operated Singer sewing machine in any busy area. Seamstresses tend to be very talented and they can interpret a western design or copy an existing dress. If the customer provides her own cloth, her dress usually costs between 8 GHC (2€) and 10GHC. For expatriates, the prices are not the same but still very cheap . Woodin shop in Accra Mall is my best place because it guarantee a great value for money (100GHC -23 €-for 6 yards). Vlisco is also another dutch company (created in 1846) but with higher prices (60 € for 6 yards). 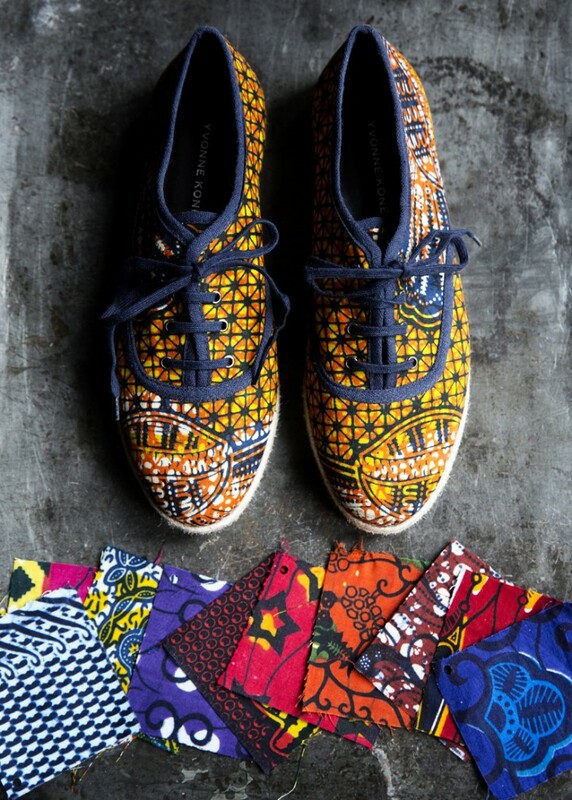 Both patterns and prints inherit from the African culture. Loincloth wax is also a means of communication to show political or social value. Know that if you see one day the fabric you like, you should buy it right now because next time it will be finish ! Collections are renew very often! Afterwards, ou have to find your seamstress to create for exemple 6 pillows for 10 GHC each (2,5€) , a dress for 40 GHC (10€), a short shirt sleeves for 30 GHC. Hope you will enjoy coming to Accra and buy some fabrics from GHANA MARKETS ! Welcome to Ghana ” Akwaaba” ! You can go to Ghana wikipedia information , “Routard” french travel guide , Lonely planet Guide to know more. The Republic of Ghana, located in West Africa along the Gulf of Guinea and Atlantic Ocean, is a sovereign unitary presidential democracy. It has a population of approximately 27 million, with different ethnic people, languages and religions. 98% of ghanaian are Black Africans. In 2010, most of the 24.2 million inhabitants were predominantly citizens of the Ashanti territories. The Government of Ghana states that the official language of Ghana is English, and is spoken by 67.1%. However, there are 11 other ethnic languages (Twi, Fente, Gâ, Mossi…). In 2010, 71% were Christian (29% are Pentecostal, 18% Protestant and 13%Catholic). In 2013, 18% were Muslims. Traditional (indigenous) beliefs are also practiced. Life expectancy is 65 years old. Ghana has a universal health care system strictly designated for Ghanaian nationals, National Health Insurance Scheme (NHIS)Ghana’s universal health care system has been described as the most successful healthcare system on the Africa continent by the renowned business magnate and tycoon Bill Gates. As of 2012, the HIV/AIDS prevalence was estimated at 1.40% among adults aged 15–49. Its geography, since Ghana is located in West Africa along the Gulf of Guinea and Atlantic ranges from coastal savannahs to tropical jungles. Grasslands mixed with south coastal shrublands and forests dominate. But Ghana has also plains, waterfalls, low hills, rivers, Lake Volta (the world’s largest artificial lake). => You will see trough my “week end pleasures” category (in the expatriation part) some articles with photos of all theses landscapes! The climate of Ghana is tropical and there are two main seasons: the wet season and the dry season. Go and see more photos in the “Kiss the seasons Goodbye” part of my blog. Ghana’s economy prosperity is the 9th-largest power on the Africa continent. It has an economic plan target known as the “Ghana Vision 2020″to become a developed country between 2020 and 2029. It produces petroleum and natural gas and export them, (it has the 5th largest oil reserves and 6th largest natural gas reserves). It is the 7th and 9th world’s largest gold and diamond producer, and tends to become the biggest cocoa producer in the world. It also produces coffee, bananas, pineapple, coconuts, yam, cashews and rice. The Akosombo Dam, built on the Volta River (and others) provide hydropower. The real estate and housing market of Ghana has become an important and strategic economic sector, particularly in Accra, Kumasi, Sekondi-Takoradi and Tema. The gross rental income tax of Ghana is withheld at 10%. Ghana ‘s good economy has given birth to a boom in the construction sector generating billions of dollars/year and a robust political stability. Ghana is one of the fastest growing and expanding shipping industry in West African Coast. Tema harbour is Africa’s largest manmade harbour and with Takoradi harbour they handle goods and exports for Ghana. It is where goods are transhipped by cargo. They export mostly cocoa, manganese, diamant, gold, wood, aluminium. With over 95% of its children in school, Ghana currently has one of the highest school enrolment rates in all of Africa. I speak about culture in several categories (food, typical things, places to visit…) in my Ghana part.